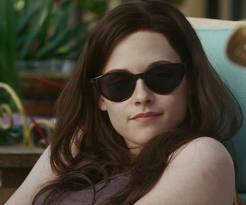 Bella in Sunglasses. . Wallpaper and background images in the 벨라 스완 club tagged: bella swan. This 벨라 스완 photo contains 초상화, 얼굴, 근접 촬영, 얼굴 만, 세로, and 헤드샷. There might also be 선글라스, 어두운 안경, and 그늘.